One of the frames from the LAMGS sprite sheet. Look At My Goomba Sprites (LAMGS) holds the record for the third longest topic in the MFGG message board's existence, after "I am new" and "Super Smash Bros Brawl NEWS!". It was created by Super_Mat_Games (Now known as SMG). This topic was started when SMG posted a large sprite of a goomba as a joke. It held 424 pages, and was also used as a new years party topic in 2003. 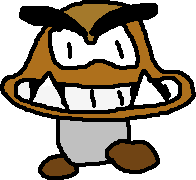 All other "Goomba Sprite" spin-off attempts have failed to reach even 50 pages. After the forums crashed because of the PPP's massive size, LAMGS was permanently deleted. This page was last edited on 25 December 2016, at 22:23.